Charcoal-infused juice is touting detox and health claims in each black sip; but is it as good as it sounds? Charcoal-infused drinks are making their way to Australia, touting detox and health claims in each black sip. The Gothic-looking drinks are simply juices to which activated charcoal has been added. Activated charcoal is just regular charcoal that’s been heated so it expands and becomes porous. The porous nature means it has the ability to capture and bind to chemicals, removing them from the body. For people who have overdosed or ingested poison, charcoal is administered medically. It binds to the chemical to stop the body absorbing them. While medical professionals administer life-saving doses of activated charcoal to the very ill, the jury is still out on whether or not it provides benefits to the average person wanting a health hit. Advocates of charcoal-infused juices claim it can trap toxins and gases from your body to remove them, drawing out impurities and detoxing you from the inside out. Claims suggest it can help reduce flatulence, bloating and stomach upsets. We know that medically, activated charcoal can bind to chemicals like fertiliser or bleach and remove them, but for the average person, I couldn’t find any information about what toxins it purportedly removes. In fact, given its highly adsorbent nature (meaning it binds to many chemicals), it could even bind to nutrients in your body, removing them. So sipping on your charcoal-infused juice while eating a huge healthy salad could mean that all the vitamins and minerals in the salad are simply removed as the charcoal recklessly binds to anything it finds in its path! Charcoal is not discriminative; it can remove good and bad from our body. So while it may remove “toxins” it can interfere with medication absorption and potentially remove beneficial nutrients. Take any medication several hours away from charcoal infused juices. The detox and health claims made by juice companies have yet to be verified by scientific studies, so don’t rely on it as a fast-track to improved health. Other side effects can be spooky looking black stools, as well as a lighter wallet. I found the juices selling for $9.00; a costly purchase for something that has no evidence to support its claims. 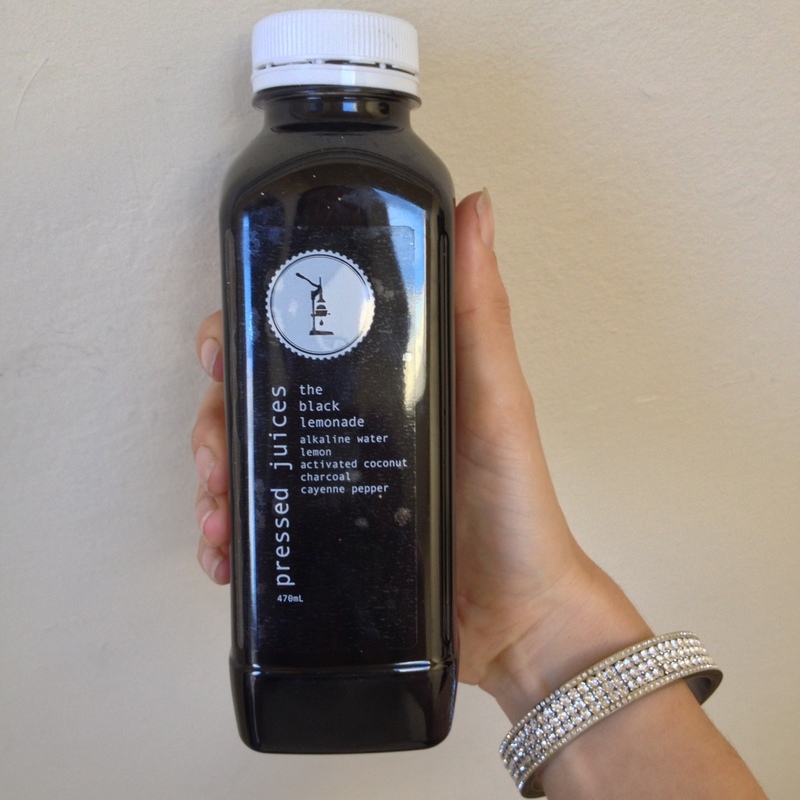 I tried the black lemonade by Pressed Juices infused with cayenne pepper. While I loved the fact it was low in sugar with only 2.4g in the bottle (juices often contain around 20g of sugar or more) it was less lemonade and more lemon flavoured water. For something that has no confirmed benefits, it was an expense I could do without. Ever one to love a new food trend, I enjoyed trying it. However, I wouldn’t rely on it as a health fix given lack of evidence to support its supposed health claims. I’m also concerned that the charcoal would prevent other nutrients being absorbed. What do you think? Do you love it, or think it’s just a hyped up marketing ploy? Previous Post Nona’s Gone Crackers! Delicious gluten-free, vegan crackers. Next Post What’s the difference between dairy-free milks?